Eli S. Hallman: minister and bishop of the Sharon Mennonite Church at Guernsey, Saskatchewan. Field Secretary for Goshen College, and bishop in congregations in Louisiana, Mississippi and Texas, was born 26 February 1866 in Waterloo, Ontario, and died at Akron, Pennsylvania, on 25 August 1955. He married Melinda Clemens (18 May 1873-12 February 1956) on 9 April 1893. They were the parents of five children. Hallman joined the Methodist church in Ontario at the age of 21, but joined the Mennonite Church following a revival conducted by the Mennonite evangelist, John S. Coffman. He was ordained as a minister at the First Mennonite Church in Kitchener, Ontario on 17 June 1897. During the first seven years of his ministry, he spent the greater part of his time conducting evangelistic services in Ontario and parts of the United States. Then, in 1905, he agreed to accompany a group of Mennonites who were moving West to the Quill Lake Mennonite Reserve in Saskatchewan. He served as the minister of the new Mennonite congregation at Guernsey, Saskatchewan, and in 1907 he was ordained in Ontario as a bishop to have oversight of the newly organized Alberta-Saskatchewan Mennonite Conference. In western Canada, and later in the southern United States, Hallman demonstrated love and acceptance of ministers of other denominations, especially the General Conference ministers of nearby communities. He was also a strong supporter and became a member of the Canadian Mennonite Board of Colonization which facilitated the immigration of more than twenty-thousand Mennonites from the Soviet Union to Canada in the 1920s. His openness to other Mennonite groups brought him many invitations to take part in special services, but he never apologized for the practices of his own congregation and conference. He tried to be firm and exercise redemptive love, and was biblical in his teaching. He greatly enjoyed teaching in the district winter Bible schools which he strongly supported. Hallman accepted an appointment to serve as Field Secretary of Goshen College in 1912, but in 1916 the family moved to Grand Bay, Alabama, for health reasons, and a little later to Allemands, Louisiana, where he assisted in the formation of a new congregation. 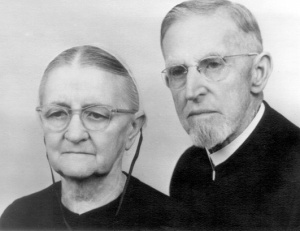 The family returned to Guernsey, Saskatchewan, in 1919, where he again served the Sharon Mennonite Church until 1928 when the Hallman family, again for health reasons, moved to Falfurrias and later in 1932 to Tuleta, Texas. There he served congregations in Louisiana, Mississippi and Texas as bishop until his retirement in 1951. Throughout his life he demonstrated a great interest in evangelism and in missions. Two of his five children became missionaries in Argentina. After his retirement he lived in Akron, Pennsylvania, where he died on 25 August 1955 at the age of 89. Regehr, T. D. Faith, Life and Witness in the Northwest, 1903-2003: Centennial History of the Northwest Mennonite Conference. Kitchener, ON : Pandora Press, 2003. Hallman, E. S. The Hallman-Clemens Genealogy with a Family's Reminiscence. Tuleta, TX, 1949, largely autobiographical. Regehr, Ted D. "Hallman, Eli S. (1866-1955)." Global Anabaptist Mennonite Encyclopedia Online. December 2003. Web. 19 Apr 2019. http://gameo.org/index.php?title=Hallman,_Eli_S._(1866-1955)&oldid=91975. Regehr, Ted D. (December 2003). Hallman, Eli S. (1866-1955). Global Anabaptist Mennonite Encyclopedia Online. Retrieved 19 April 2019, from http://gameo.org/index.php?title=Hallman,_Eli_S._(1866-1955)&oldid=91975. This page was last modified on 23 August 2013, at 14:03.